1. ACKNOWLEDGES, AGREES and REPRESENTS that s/he has or will immediately upon entering or allowing his/her minor child to enter any of such RESTRICTED AREAS, and will continuously thereafter, inspect the RESTRICTED AREAS which s/he enters and/or allows his/her minor child to enter, and s/he further agrees and warrants that, if at any time, s/he is in or about RESTRICTED AREAS and s/he feels anything to be unsafe, s/he will immediately advise the officials of such and if necessary will leave and/orremove his/her minor child from the RESTRICTED AREAS and/or refuse to participate and/or allow his/her minor child to participate further in the EVENT(S). 2. ACKNOWLEDGES AND AGREES that Springfield's Incredible Pizza Company, LLC d/b/a Spring Town is an independently owned and operated America's Incredible Pizza franchise. Neither Incredible Pizza Franchise Group, LLC, the Owner, nor the Lessor ofthe premises where the EVENT(s) are located has any duty to inspect, oversee or supervise the EVENTS or the RESTRICTED AREA. 3. HEREBY RELEASES, WAIVES, DISCHARGES AND COVENANTS NOT TO SUE Springfield's Incredible Pizza Company, LLC d/b/a Spring Town, Incredible Pizza Franchise Group, LLC, the owner and/or lessor of the premises, and their agents, owners,members, shareholders, directors, officers, partners, employees, volunteers, participants, manufacturers, affiliates, subsidiaries, related and affiliated entities, successors and assigns, all other persons or entities acting in any capacity on their behalf, and persons in the RESTRICTED AREA (collectively referred to as the Releasees) FROM ALL LIABILITY TO THE UNDERSIGNED, his/her minor child, his/her personal representatives, assigns, heirs, and next of kin FOR ANY AND ALL LOSS OR DAMAGE, AND ANY CLAIM OR DEMANDS THEREFOR ON ACCOUNT OF INJURY TO THE PERSON OR PROPERTY OR RESULTING IN DEATH OF THE UNDERSIGNED ARISING OUT OF OR RELATED TO THE EVENT(S), WHETHER CAUSED BY THE NEGLIGENCE OF THE RELEASEES OR OTHERWISE. 4. WARNING!!! PARTICIPATION IN TRAMPOLINE ACTIVITIES IS NOT SUITED FOR EVERYONE. The Undersigned ACKNOWLEDGES AND AGREES that participation in the EVENTS IS DANGEROUS and entails known and unanticipated risks that could result in physical or emotional injury, paralysis, death or damage to me, my child, to property, or to third parties. I understand that such risks simply cannot be eliminated without jeopardizing the essential qualities of the EVENTS. The risks include, but are not limited to: slipping and falling, collision with fixed objects or people, injuries that include: sprains, fractures, scrapes, bruises, cuts, dislocations, pinched fingers, and serious injuries to the head, back or neck; the negligence of other participants, me, or my child; my own or my child's physical condition; physical contact with others; failure to warn of an inherent risk.Traveling to and from trampoline locations raises the possibility of any manner of transportation accidents. Double bouncing, more than one person per trampoline, can create a rebound effect causing serious injury. Flipping, running, and bouncing offthe walls is dangerous and can cause serious injury and must be done at the participant's own risk. Do not land on head or neck. Paralysis or death can result, even if you land in the middle of the trampoline mat (bed). To reduce the chance of landing on your head or neck, do not do somersaults (flips). 5. In any event, if you or your child is injured, you or your child may require medical assistance at your own expense. Each of THE UNDERSIGNED, also expressly acknowledges that INJURIES RECEIVED MAY BE COMPOUNDED OR INCREASED BY NEGLIGENT RESCUE OPERATIONS OR PROCEDURES OF THE RELEASEES. 6. HEREBY AGREES TO INDEMNIFY AND SAVE AND HOLD HARMLESS the Releasees and each of them FROM ANY LOSS, LIABILITY, DAMAGE, OR COST they may incur arising out of or related to the EVENT(S) WHETHER CAUSED BY THENEGLIGENCE OF THE RELEASEES OR OTHERWISE. 7. HEREBY ASSUMES FULL RESPONSIBILITY FOR ANY RISK OF BODILY INJURY, DEATH OR PROPERTY DAMAGE arising out of or related to the EVENT(S) whether caused by the NEGLIGENCE OF RELEASEES or otherwise. 8. HEREBY agrees that this Release and Waiver of Liability, Assumption of Risk and Indemnity Agreement extends to all acts of negligence by the Releasees, INCLUDING NEGLIGENT RESCUE OPERATIONS and is intended to be as broad and inclusive as ispermitted by the laws of the State of Missouri and that if any portion thereof is held invalid, it is agreed that the balance shall, notwithstanding, continue in full legal force and effect. 1. I HAVE READ THIS RELEASE AND WAIVER OF LIABILITY, ASSUMPTION OF RISK AND INDEMNITY AGREEMENT, FULLY UNDERSTAND ITS TERMS, UNDERSTAND THAT I HAVE GIVEN UP SUBSTANTIAL RIGHTS BY SIGNING IT, AND HAVE SIGNED IT FREELY AND VOLUNTARILY WITHOUT ANY INDUCEMENT, ASSURANCE OR GUARANTEE BEING MADE TO ME AND INTEND MY SIGNATURE TO BE A COMPLETE AND UNCONDITIONAL RELEASE OF ALL LIABILITY TO THE GREATEST EXTENT ALLOWED BY LAW. 2. I know the risks involved in participation in the EVENTS, understand that serious injury and even death is possible in such participation and choose to accept such risks. I understand that the Releasees do not have any obligation to determine whether this activity is suitable for me. I voluntarily accept any and all responsibility for my own safety and welfare while participating in the EVENTS and while being present in the RESTRICTED AREA with understanding of the risks involved. I expressly agree and promise to accept and assume all the risks existing in the EVENTS. My participation in the EVENTS is purely voluntary and I elect to participate in spite of the risks. 3. I hereby voluntarily release, forever discharge and agree to defend, indemnify and hold harmless the Releasees from any and all claims, demands, or causes of action, which are in any way connected to my participation in the EVENTS or my presence in the RESTRICTED AREA, including any such claims that may arise out of the negligence of the Releasees. 4. Should the Releasees be required to incur attorneys' fees or costs to enforce this Agreement, I agree to indemnify and hold the Releasees harmless for all such fees and costs. 5. I certify that I have adequate insurance to cover any injury or damage that I may cause or suffer while participating, or else I agree to bear the costs of such injury or damage myself. 6. I certify that I have not been advised by any medical advisor not to engage in activities like the EVENTS and further certify that I am willing to assume the risk of any medical or physical condition I may have. 7. I agree to release, defend, indemnify and hold harmless Releasees in the event they are made a party to a lawsuit as a result of my negligence. Such indemnification shall include attorneys' fees and costs in the event the Releasees are required to defend themselves. 8. I agree that I will follow the rules of Spring Town at all times. 9. I agree that I will follow the instructions of the Spring Town employees at all times and that any employee may direct me to immediately leave the RESTRICTED AREA at any time for any reason. If I receive such an instruction, I agree to immediately leave the RESTRICTED AREA. 10. I agree that I will immediately upon entering the RESTRICTED AREA, and will continuously thereafter, inspect the RESTRICTED AREA for any unsafe condition. 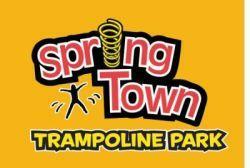 If I notice or feel anything to be unsafe, I will immediately notify the employees monitoring the Springtown Trampoline Park and if necessary will leave the RESTRICTED AREAS and/or refuse to participate further in the EVENT(S). 11. In the event that I file a lawsuit against the Releasees, I agree to file it only in Greene County, Missouri. I agree that the laws of the State of Missouri will apply to any action relating to, involving or arising from the EVENTS, the RESTRICTED AREA, or this WAIVER. I agree that if any portion of this Agreement is found to be void or unenforceable, the remaining portions shall remain in full force and effect. 12. In consideration of being permitted to participate in the EVENTs, I grant Spring Town the irrevocable, assignable right and permission to photograph and/or record me in connection with the EVENTS, to use the photograph and/or recording for all purposes, including advertising and promotional purposes in any manner and in any and all media now or hereafter known, in perpetuity throughout the world, without restriction as to alteration. I waive any right to inspect or approve the use of the photograph and/or recording, and acknowledge and agree that I am not entitled to any further compensation of any kind. NOTICE TO THE MINOR CHILD'S PARENT OR LEGAL GUARDIAN READ THIS FORM COMPLETELY AND CAREFULLY. YOU ARE AGREEING TO LET YOUR MINOR CHILD ENGAGE IN A DANGEROUS EVENT. YOU ARE AGREEING THAT, EVEN IF SPRING TOWN USES REASONABLE CARE IN PROVIDING THIS EVENT, THERE IS ACHANCE YOUR CHILD MAY BE SERIOUSLY INJURED OR KILLED BY PARTICIPATING IN THIS EVENT BECAUSE THERE ARE CERTAIN DANGERS INHERENT IN THE EVENT WHICH CANNOT BE AVOIDED OR ELIMINATED. BY SIGNING THIS FORM YOU ARE GIVING UP YOUR CHILD'S RIGHT AND YOUR RIGHT TO RECOVER FROM SPRING TOWN IN A LAWSUIT FOR ANY PERSONAL INJURY, INCLUDING DEATH, TO YOUR CHILD OR ANY PROPERTY DAMAGE THAT RESULTS FROM THE RISKS THAT ARE A NATURAL PART OF THE EVENT. YOU HAVE THE RIGHT TO REFUSE TO SIGN THIS FORM, AND SPRING TOWN HAS THE RIGHT TO REFUSE TO LET YOUR CHILD PARTICIPATE IF YOU DO NOT SIGN THIS FORM. 1. I represent that I have full authority as Parent or Legal Guardian to bind the below identified minor participant to this Agreement. 2. I know the risks involved in participation in the EVENTS, understand that serious injury and even death is possible in such participation and choose to accept such risks. I understand that the Releasees do not have any obligation to determine whether this activity is suitable for my minor child or ward. I voluntarily accept any and all responsibility for my child or ward's safety and welfare while participating in the EVENTS and while being present in the RESTRICTED AREA with understanding of the risks involved. On behalf of my child or ward, I expressly agree and promise to accept and assume all the risks existing in the EVENTS. My child or ward's participation in the EVENTS is purely voluntary, and I elect to allow my child or ward to participate in spite of the risks. 3. In consideration of my child or ward being allowed access to the RESTRICTED AREA and/or participation in the EVENTS, I hereby voluntarily release, forever discharge and agree to defend, indemnify and hold harmless the Releasees from any and all claims, demands, or causes of action resulting from the inherent risks in participating in the EVENTS. I am not releasing any claims on behalf of my minor child or ward arising out of the gross negligence or intentional misconduct of Spring Town and/or their employees. 4. I further agree to defend, indemnify and hold harmless the Releasees from any and all claims or suits for personal injury, property damage, or other wise which are brought by, or on behalf of my minor child or ward, including those as a result of the negligence of the Releasees and which are in any way connected with the use or participation by the minor, including injuries or damages caused by negligence of Spring Town. 5. Should the Releasees be required to incur attorneys' fees or costs to enforce this Agreement, I agree to indemnify and hold the Releasees harmless for all such fees and costs. 6. I certify that I have adequate insurance to cover any injury or damage that my minor child or ward may cause or suffer while participating, or else I agree to bear the costs of such injury or damage myself. 7. I certify that I have not been advised by any medical advisor that my minor child or ward should not to engage activities like the EVENTS. I certify that I am willing to assume the risk of any medical or physical condition that my child or ward may have. 8. I agree to release, defend, indemnify and hold harmless Releasees in the event they are made a party to a lawsuit as a result of my child or ward's negligence. Such indemnification shall include attorneys' fees and costs in the event the Releasees are required to defend themselves. 9. I agree that my minor child or ward will follow the rules of Spring Town at all times. 10. I agree that my minor child or ward will follow the instructions of the Spring Town employees at all times and that any employee may direct my minor child or ward to immediately leave the RESTRICTED AREA at any time for any reason. If my minor child or ward receives such an instruction, he/she must immediately leave the RESTRICTED AREA. 11. I agree that at all times while my minor child or ward is present in the RESTRICTED AREA I will have an adult present in the viewing area who will continuously watch my minor child or ward and will inspect the RESTRICTED AREA for any unsafecondition. If I notice or feel anything to be unsafe, I will immediately notify the Spring Town employees and if necessary will remove my minor child or ward from the RESTRICTED AREAS and/or refuse to allow my minor child or ward to participate further in the EVENT(S). 12. In the event that I file a lawsuit against the Releasees on behalf of my child or ward, I agree to file it only in Greene County, Missouri. I agree that the laws of the State of Missouri will apply to any action relating to, involving or arising from the EVENTS, the RESTRICTED AREA, or this WAIVER. I agree that if any portion of this Agreement is found to be void or unenforceable, the remaining portions shall remain in full force and effect. 13. I agree as the Parent/Legal Guardian of a minor participant, in consideration of being permitted to participate in the EVENTs, I grant Spring Town the irrevocable, assignable right and permission to photograph and/or record my minor child or ward in connection with the EVENTS, to use the photograph and/or recording for all purposes, including advertising and promotional purposes in any manner and in any and all media now or hereafter known, in perpetuity throughout the world, without restriction as to alteration. I waive any right to inspect or approve the use of the photograph and/or recording, and acknowledge and agree that neither I nor my minor child or ward is entitled to any further compensation of any kind. 14. BY SIGNING THIS DOCUMENT, I ACKNOWLEDGE THAT IF ANYONE IS HURT OR PROPERTY IS DAMAGED DURING MY MINOR CHILD OR WARD'S PARTICIPATION IN THE EVENT AND/OR PRESENCE IN THE RESTRICTED AREA, I AND/OR MYMINOR CHILD OR WARD MAY BE FOUND BY A COURT OF LAW TO HAVE WAIVED MY OR THE MINOR PARTICIPANT'S RIGHT TO MAINTAIN A LAWSUIT AGAINST SPRING TOWN AND THE OTHER RELEASEES. I HAVE HAD SUFFICIENTOPPORTUNITY TO READ THIS ENTIRE DOCUMENT. I HAVE READ THIS RELEASE AND WAIVER OF LIABILITY, ASSUMPTION OF RISK AND INDEMNITY AGREEMENT, FULLY UNDERSTAND ITS TERMS, UNDERSTAND THAT I HAVE GIVEN UPSUBSTANTIAL RIGHTS FOR ME AND MY CHILD OR WARD BY SIGNING IT, AND HAVE SIGNED IT FREELY AND VOLUNTARILY WITHOUT ANY INDUCEMENT, ASSURANCE OR GUARANTEE BEING MADE TO ME AND INTEND MY SIGNATURE TO BE A COMPLETE AND UNCONDITIONAL RELEASE OF ALL LIABILITY TO THE GREATEST EXTENT ALLOWED BY LAW.